I love this app. It is a bit more portable then my hard copy set of books and no more page flipping means it is a bit easier to stay in the proper mindset while praying. I love this app. It has almost everything I can think of to make it possible to follow Mass, to pray, to read.... The things I would love to have are: access to the continued readings when using the proper readings of the saint of the day or the optional readings for a common Mass (this is what is done where I go to Mass) also to have drop down menus to choose from a selection of proper readings instead of having to scroll through all the options (e.g. all the possible readings for Our Lady on Saturday) to get to the ones chosen by the priest, and to be able to select from votive Masses (e.g. votive of the Eucharist is said a lot on Thursdays where I go to Mass). I love reading about all those venerable English martyrs... great examples for us today. Thanks, Universalis! As clergy, one of our commitments is to pray the office. This application provides us with the text and audio, in English and in Latin (the Latin voice for some of the hours), such that I can close my eyes transport myself, along with the brethren praying all around the world, into a mystical union. It’s absolutely beautiful rendition with a clear voice that is peaceful, well paced and understandable. Note that the English version is a bit different than used in the USA, the Latin is provided which is purely consistent the world over. God’s Blessings!!! Been using this app for about a year now and it is absolutely worth the money. I own the one volume and four volume sets, and constantly find myself drawn back to this app. The latest update, which combines the Office of Readings with another office, makes this the PERFECT app for LOTH. Keep improving! Thank you so much for including hourly alerts in this app. Because I have the app also linked to my watch, no matter where I am or what I’m doing, they remind me I’m ALWAYS in the Presence of God. It’s all right here, including every Mass option. Being a lector, this is invaluable to me. Universalis has truly been a blessing! Great app, helpful in my daily spiritual life!! Keep up the great work. I purchased a 100% audio version of Divine Office a few years ago for about $20.00. It suddenly disappeared when I updated my iPad one time. I thought this was audio not text. If I had known I would not have purchased it. Since it was an iPad app, I assumed it was audio. My fault for not checking. I realize you can pay extra for song but that’s not what I want. Dissapointed! BRAVO. I am a Lector and am very familiar with the official Lectionary of the Catholic Church. Universalis always gets the Calendar, Readings, and Mass prayers correct. 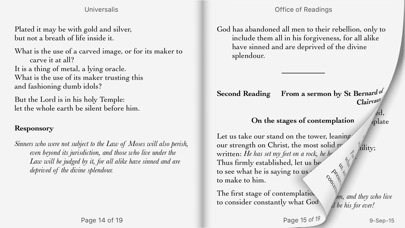 I use Universalis “Readings at Mass” and “About Today” every day for my personal study and devotion. In addition, when attending Mass at a church where there are no full Missalettes, I use the “Mass Today” and “Order of the Mass”: it is always right on the mark for the entire readings and prayers for the Mass! I also like the ability to quickly go to any day of the Liturgical year and see the Feast/Memorial of the Saint of that day. Universalis has already added the brand new Feast “Mary the Mother of the Church” for the Monday after Pentecost! Praying the Liturgy of the Hours is somewhat complex for the average lay-person. Universalis makes it simple. The translations are different than some Breviaries, so may not be as useful for group recitation if all do not have the App. But the essence of each prayer is the same. May not be 100 pct perfect, but the ability to pray the LOH anytime, anywhere on your mobile device is literally a God-send. NOTE: to get the correct readings and calendar for your Diocese - it is important to go to the settings and select the local liturgical calendar for your country / region. For instance, in the USA, 6 Diocese celebrate The Ascension on the Thursday; the remainder celebrate on the Sunday. The Universalis settings options get it right. The app has been awesomely created and in presentation it looks qualitatlively superior to all the other free apps I‘ve run into so far for the Liturgy Of The Hours. I live in the US and have recently started to lead a prayer group in my workplace, and here comes the big problem: fellows familiar with the Office and owners of physical breviaries or users of free apps follow the New American Bible translation. And of course I cannot force people to spend money in an app just because I as the leader just feel comfortable using the Universalis app and hence following a Bible translation that nobody else follows in my group... So I guess in the meantime I‘m gonna start using another app like iBreviary, which is great and uses the NAB translation but is not that flexible and rich as Universalis. That until hopefully the Universdalis developers incorporate the NAB option as it‘s the case for the Readings at Mass. I don‘t regret having spent 11 bucks for the app though; like I said, it‘s been a great tool but for the moment just for personal prayer here in the US, maybe not for group prayers with American fellows. This is my go to app to start and end the day with and with all the new additions it just gets better and better. What happens to the biennial?!?!?? I use this app every day. I love your lives of the saints!! Bring back the biennial!!!!! The office has proverbs when it should be Thessalonians. I’ve waited for you to add since ordinary time started again but there is nothing. I bought this when it was still priced at $32. It was way overpriced! Well, there were no other options before. (It's current price is still high when other apps function the same way.) Now, there are better ones. I have imissal, and I'm very happy with it (only $4.99). And iBreviary, which gives you the whole mass, prayers, liturgy of the hours, readings, and other rites. And it's free. (of course, you have to download every now and then which can last you for 2 to 3 weeks). Universalis has the liturgy of the hours but the translation doesn't match official translation so that you cannot really join in community recitation for having a different version. Will I recommend universalis? If its your first time, you can get the 2 apps above, cheaper, free, and it will do the job as a combination. I love thus app because I can access readings at mass without internet connection. It would be even better if the opening prayer, prayer over the gifts, preface and post-communion prayer are also included. I loved this app especially on the iPad until version 1.42 came out. I do not like the page flipping it is buggy and does not look as crisp as iBook. My suggestion is that you make page flipping optional. Also the layout was perfect in 1.41, I liked the way the app was like the horizonal verion of mail for the ipad. In 1.42 the date changing bar floats and covers the text of the day. You can no longer scroll thru dates and see the corresponing text. The bar now covers the text in the iPad version. This is an excellent app but I am very sorry I updated to 1.42. The 1.42 version of the app is distracting. Please I beg you return the app to the 1.41 version and make page filling an option. The prior versions of the app would receive 5 stars but 1.42 only ranks 4 stars. This is a nice app. But a minor bug and a few omissions deserve a mention. When I use the largest font size and enable scrolling, sometimes it will not scroll unless I adjust the font size slightly smaller than the largest settings. I would love to see the mass prayers, the order of the mass, the apostle's creed, and so forth. The app could be structured with views that either show only the readings or include the entire mass for those of us that wish to see everything in one place, which has never been possible with printed missals. There are times when the church reads verses from different years for some reason. 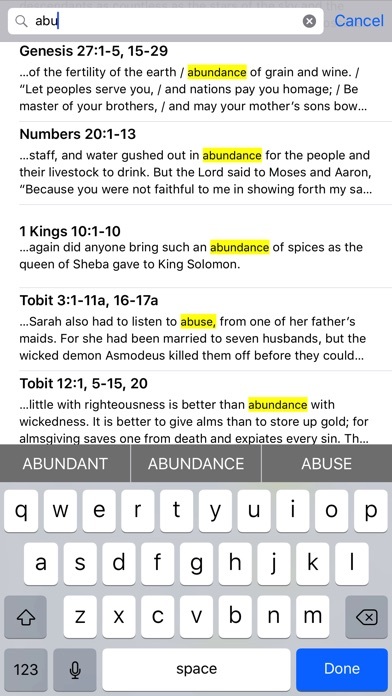 To ease following along, it would be nice to have a quick switch to liturgical year a, b, or c. The entire bible text could have been included with basic search with just a little extra effort and would have been a really nice benefit. The app is quite useful for what it does. At this price, however, it is a poor value. As one of the higher priced apps in the app store, I would hope it were also one of the best apps in the app store. As I understand it, the PC, Mac, and online tools are all included in the price. I gave the app a bonus star for that. With these versions and the free updates in the future, I look forward to using this app and I will be watching for new features over time. 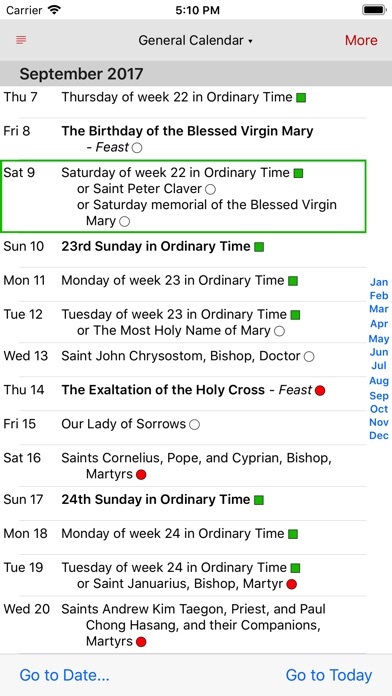 This app allows you to have the complete liturgy of the hours at your fingertips as well as a liturgical calendar and mass readings. Has Grail psalter used in English and American breviaries. Love it but . . . I loved the version before the addition of the page turn more. I originally gave this app five stars and now after the updates, I wish I could give it six. The parallel Greek/English is fantastic for my needs, and the artwork in landscape book- mode was a pleasant surprise. I don't mind the NJB readings for the hours, because most Breviaries use the Grail psalms, and so I can use this app when praying with a group. Been using the PC version for years and this is just as good! The full Office with several nice options like either using the same invitatory psalm every day or a different every day. All this with a lifetime license. Good people with a great app. First, it is too expensive!!! The english used in the prayer of the Liturgy of the hours is totaly different! And, version of the bible readings is not the New American Bible; therefore, it is different to the Mass lectionary. BETTER: buy ipieta ($2.99) or ibreviary($.99), especially ibreviary is 100% the same to what you pray and read in Mass, and it gives you multilingual options! Tap the little "i" on the lower left hand part of the display when you are looking at the calendar. I have so far been very pleased with this app. It has made prayer a much more present aspect in my life. I do have a few suggestions, however, that I think would make the app even better. First, being able to select one of the Common Prayers of the day not universally recognized on that day. Perhaps to be able the Common of the Dead on the anniversary of a loved one's departing. 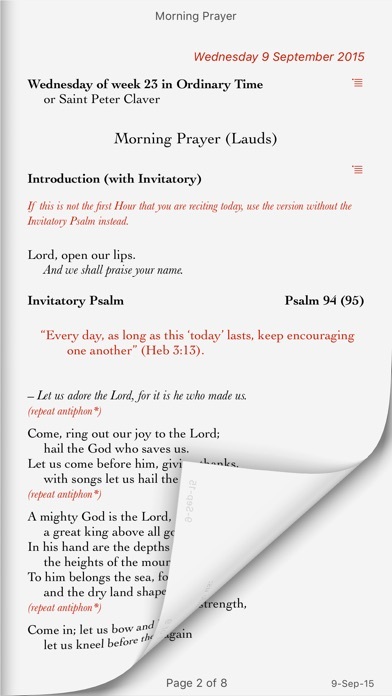 Second, to make the antiphon slide down the page as you scroll down the psalm until the next psalm (similar to how the letter of the alphabet scrolls down with the listings under that letter in the iPhone's address book) would be a very convenient feature, especially on some of the longer psalms. Lastly (and I'm not sure if this is even possible due to possible copyright restrictions), a New American translation of the Scripture passages would be very much appreciated, to allow the American users to follow along with people using a book and not this app. Keep up the great work, and thanks for the wonderful app! This app has been good from the beginning, and just keeps getting better with every update. The full app is well worth the money. It is wonderful to have all the reading from both the breviary and mass available to me anywhere. Format is well done and easy to read. Thank you for your work and can't wait to see what's next. I have used this app daily for over a year. I am totally satisfied with its content and its performance. It is easy to use and offers a variety of options. I love that one price pays for use on all my devices. Worth every penny. I like this app but like other reviewers, I'd like to see the breviary used in the U.S. along with the New American Bible. The price is a little steep but it's only one-time. Good job. Actually, I liked the previous version more than 1.42. Turning pages on my Ipad is a real hassle. Pages get stuck often (most often between each hour). Vertical scrolling appears to be broken -- even though I have selected vertical scrolling I am only able to move forward is by turning pages. For me this makes for a not so pleasant experience. Two small things: 1) Including the propers would be awesome. 2) Embedding the readings, propers, etc. into the order of Mass (so we can just scroll down one long page to follow along) would be even more awesome. I concur and heartily second Jerry's evaluation and recommendations for improvement. I also wish the New American Bible was available for download. The Protestants have several choices. We Catholics have only one and I can't find a downloadable one anywhere. The program is convenient and I use it when I do not have internet access on my phone for a longer period of time. However, the translation (Jerusalem) is not at all what I'm used to. I use a free program called iBreviary, which has everything that this program has, but uses the NAB (for those praying the Breviary in the US), however, you have to load the readings each day , which requires internet access (it takes about 5-10 seconds to load). It is a wonderful app. I use it for praying the Divine Office (when I travel). Would love to see an option of the Divine Office in NAB. I also wish that someday an 'auto-scroll' feature would be added, so that we do not have to touch the screen all the times to scroll (e.g. while praying the Psalms etc.). By the way, I am a rather new user, if an auto-scroll feature already exists, will someone let me know how to use it! Thank you greatly for the talents and time put in to make the app remarkable! I use it as a missal and for the divine office. This app rocks. It would be nice to have the psalms and an NAB version, though. Other than that, it's perfect. It costs twenty-four of the crispest, and it's wourth every cent. Very easy to use. A search function would be nice, but the lack is not terrible. Definately Five Stars. Lost in the sauce. I just started doing the LoH and was plaguing my priests about how to use my book. Finally, the priest who knows best how I learn suggested I try an iPhone app. When I found this app, I was blown away! Other apps will offer you the different hours individually but this one has them all together. I also like that it has more readings than the other apps. While the price could be a little lower, it's not bad for the lifetime use and convenience. It's definitely cheaper than my LoH book. Hello, Universalis. I really like this app. There are, however, two things that would make it even better. 1. With all the text that's included, for some reason you've left out the Psalm in the "Readings at Mass" section. All the other Hours include the Psalms or relevant portions thereof, but when it comes to the Mass one has to look it up elsewhere. Surely this was an oversight? It would be really helpful not to have to quit Universalis and look up the pertinent Psalm in Olive Tree, which I also have. Plus there's the eternal confusion over numbering. Please include the Psalm in the Mass Readings! 2. Couldn't you please offer the NAB as an alternative to the Jerusalem Bible? Nothing against the latter, but they're SO different, and I'm much more familiar with the NAB. If one could choose between several texts, as with Olive Tree, that would be marvelous. Given the ease of collating things with computers, I wouldn't expect it to be too hard to do, either. For the price it should be an option. Otherwise a handsome and useful app! I use this everyday It is worth the money The addition of the psalms for terce, sext and nonce is great. The translations of the Liturgy of the Hours used by this app are not approved by the Church. Be advised that if you get this, you will not be praying "with the Church." It does not fulfill any spiritual liturgy of the hours obligations. This is admitted by the developers, but is hidden away in the FAQ page of their website. Read the FAQ on their site for more info, particularly questions 8 and 13. That said, there is nothing wrong with praying these as a PERSONAL prayer. Also, the calendar, about today, and mass readings are useful features. However, Universalis should be well aware that MANY Catholics will purchase this app under the impression that they can use it to pray the office...with the Church. Yet, Universalis doesn't mention this (the fact that it is not an approved translation and that it doesn't count as a fulfillment of obligation to pray the office) anywhere on the app description which I believe is incredibly dishonest. It can and has resulted in people realizing that they have wasted money on something they would not have purchased if Universalis had been up front about the legitimacy of this version of the "Divine Office." For dishonesty and for not simply taking the time and effort to provide the APPROVED version in light of charging people so much money, this app loses 3 stars. Makes the Liturgy of the hours so accessible. One question, though? Why does it sometimes say 'Shake Me'? Update: The new version is even better… the "mass today" combines all the different prayers, antiphons, readings, and order of mass into one. So great. Keep up the good work, Universalis! ---- This app is great for a few reasons: 1. All of the content for every day of the year for all three years of the cycle is offline, on the app. No Internet connection whatsoever is required. 2. The app is very well programmed, with hardly any bugs or crashes. 3. The daily mass readings are the same word for word NAB translations used at mass. 4. The Order of the Mass texts and the readings are formatted nicely and very easy to read. 5. With the price of this app you also get the desktop version of the app for Mac. The "about today" feature is also great. The only thing I would change is that it'd be nice if the LOTH texts were the same as in the USA breviary, though that's not a huge deal. Overall this app is fantastic- you'll use it every day! This is a great service if you have the pre iOS7 version. The iOS 7 version is very hard to read. My opinion: don't take the update. This is good. Very helpful. you are on the other calendar year of ordinary time, why is that ?. ethically, socially, politically, morally and legally unacceptable. Please add the Revised Standard Version catholic edition for the readings at Mass. Some African countries use the RSV. Contrary to the readers who obsess about your incorrectness/lack of "true Church approach" to LOH --- This app is one class act! And it continually improves on itself. The perfect way to carry the LOH with me. Thank you. Get IBreviary or one of the others that are free or cost less. This app is one of the most expensive and has no benefits over free versions You can't even use the iPhone speak function it's locked out You have to buy it from them. Save your money. Once you buy an app there is no getting your money back. I used to subscribe to monthly mass booklets that had the daily and Sunday prayers. This one does it all for a fraction of the price. Or free if you want day to day. Easy to use. Has alternative prayers. Scroll or page turn..your choice! Great addition to your religious app library. This text is fine for devotional use. Only priests and religious in the United States are bound to the official American texts. I personally use this translation as well as the official American version. just started using it but can’t figure out how to make the lettering larger. When I'm home I prefer the four volume LOH, but when I'm in my office I like this app. When you're praying privately it doesn't matter what translation you use--prayer is prayer. If you want to use the official prayer wording, then use Latin. But this app won't work for you if you absolutely have to use the same English as in the printed volumes. The app is constantly being improved. Having said all this, I would like to see crosses marking the Gospel canticles as a reminder to make the Sign of the Cross when reciting those parts. Lost, forgotten, disconnected, too difficult and unappreciative are no longer applicable to Catholicism when using this app. For me and others it neatly presents the gifts of the Church wrapped so well that everyday is s gift. The more you invest in the app the greater the reward. When I upgraded from the freebie version of this to the paid version I thought the translations would be NAB across the board. Since I live in the USA, this is what I need. What I found was that I can get that translation for the daily readings but for the LOH, which is really what I wanted this app for, everything is frequently all wrong. The translations may or may not be NAB but the psalms, hymns, etc., are not correct. It seems like the app is Euro-focused. There is a more expensive "Divine Office" app that contains the liturgy for America, so I'm out the money for this app and now moving to that one. When reading reviews of this app, consider the country the reviewer lives in. This is absolutely my favorite app to use for Catholic mass, when it works. Unfortunately there have been too many occasions such as now, when there are prayers that are left out or or incomplete. Currently the prefaces are a problem, but there have been other issues on and off in the past. The app developer is attempting to be helpful, but is currently unable to resolve the issue. I would caution against buying this app while these issues persist. All the options for every Eucharistic prayer isn't showing up all the time. Latest update put night mode date selection bar white on white! This is a great App for praying the Liturgy of the Hours. It contains all I need for my daily Catholic prayers and Mass readings. There are a number of font choices and you can easily adjust the font size. It does not contain the vocalization of the prayers like alternative Apps, but it is more than I could have expected. I highly recommend this App! That when invoking night mode, the app hijacks the brightness setting, which I always have set to automatic. So I have to reset the brightness settings every time I use this app at bedtime. The app does not offer anything traditional. It's based on the Vatican II New Mass and New calendar. The readings are not from the Catholic Douay-Rheims Bible. I read the readings for the Mass for the next day every evening. It's a great preparation and reminder, and it gives me a chance to look up puzzling passages to reflect upon. I love this app. I have been using Universalias for several years now, and it has more or less replaced my old, increasingly worn, physical copy of the divine office. The calendar of saints, the mass readings, and now the integration with the iOS8 today screen all add further value to what was already a fantastically good deal. For practising Catholics, or anyone interested in an aid to private devotion, this App should be on the 'must have' list. I looked extensively for the best app to follow along in mass. I wanted to see the daily collects/prayers, seasonal prefaces, and the various eucharistic prayers, in English and Latin. This has it all, and it's easy to use. Much more so than, say, the Magnificat app. Keep in mind this is just ordinary form - no extraordinary. Love this app and use it almost daily. My only complaint is that when I attempt to get it to play to audio recording of morning prayer in the Liturgy of the Hours, it kicks me out of the app. Which is disappointing. Also can the other Hours, such as Evening Prayer get an audio option? I think that would be great! if you are buying this for the Divine Office don't, the text is wrong. It is not the version used by religious or lay people in the United States. If used by a lay person you will not be able to say the Office with others in group or community. Other than that the app is excellent. Fantastic reading options include ability to change don't sizes, typeface, brightness, and even switch to night mode. Navigation is easy and intuitive. Booklet facing page is fine. Needs letters to be bigger for easier read. Convenience for travel without wifi is neat idea. This is a more expensive app but definitely worth the money. Is based directly on feast days, gospels of that day. Excellent. Includes mass readings and optional memorials. Works offline. I bought the full app years ago. the recent modifications means that if you try to scroll through the pages too quickly, you get a yellow banner notice about making the font smaller. YOU CANNOT SCROLL THROUGH TOO QUICKLY WITHOUT SEEING THIS IRRITATING AND UNNECESSARY YELLOW BANNER. Who thinks this is a good idea? Why is it there ALL THE TIME? Great app! A tad expensive for not as accurate translations as official Breviary. Any way to remove the red play button from bottom left in future updates would be appreciated. This app is a must for any Catholic priest/religious. I've been using it for over 3 years now and it has been so helpful for personal use, as well as for projecting the divine office and mass readings during retreats and prayer meetings. And I'm really pleased that they now have the apple page curl :). Easy to navigate app that shows prayers part of the Liturgy of the Hours (Morning Prayer, Evening Prayer, etc) and readings for Mass. It has an About Today section where you can read about the holiday or saint being honored that day. Lots of great information in a classy format that is easy to use. This is my missal at mass. The use of other bibles would help when visiting some churches. It does need an option to clear your calendar if you accidentally populate your calendar with a year of info. Easy to navigate, many features & uses, can be easily used offline. I tried a free app for the hours too, and it didn't hold a candle to Universalis. One of my top apps. This app is great for praying the liturgy of the hours - it loads quickly and I’ve not had any problems with it shutting down unexpectedly or acting buggy. It is easy to use. I can quickly get to the daily Mass readings. I can choose which version. Also if the lecture is doing an alternate reDing I can easily switch. I also know ahead of time if there are alternative readings. Great for when I am a lecture. I have a notification for the 12:00 prayers. And it brings me right to my prayers. Also new that I came be reminded of my loved ones date of death and read something that I have written about them. Use this daily. The alerts and hourly “moments” (small verses) are great. Support staff is great. Definitely recommend for reading the Liturgy of the Hours on the go.